The NVRS Tactical 2.5x50 (gen.1) is an affordable scope that provides comfortable viewing, high performance and accurate shooting. The NVRS line is the hunter's best friend with its ruggedness, durability and ease of use. These riflescopes are equipped with the powerful and safe infra-red flashlights providing recognition of objects in absolute darkness at distances up to 200 meters. The riflescopes are completed with the remote console to switch on a riflescopes or its IR flashlight from an fore-end of rifle. The oblique ergonomic blinker protects an eye from extraneous flares, masks a green luminescence of the image intensifire tube. 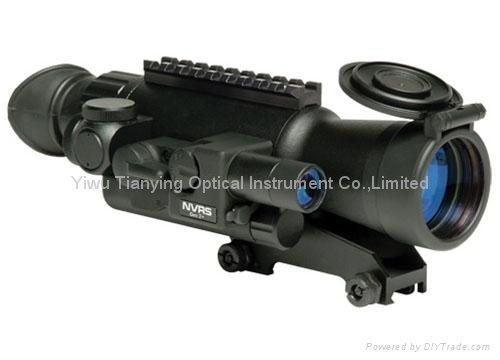 The construction of the riflescopes provides excellent damp-proofing of all item, including high-voltage part of the image intensifier tube, that guarantees uninterrupted and safe work of the device. The ON/OFF switches for power and the built-in Infrared Illuminator are designed to prevent hand cramps and accommodate users wearing gloves. The battery powered night vision riflescope comes standard with an ON/OFF remote control for a hands-free use and a camera adapter for nighttime photography (for Weaver-mountable Riflescopes only). And don't worry about re-mounting the NVRS after each use with its standard on-rifle carrying case. The case fits around the NVRS while it is mounted on the rifle for easy storage. Each unit is fit with a flip-top objective lens cover that protects the high-quality image tube from intense light that could damage the tubes. This versatile and affordable unit can be used for numerous outdoor activities and is perfect for the outdoor enthusiast. Your NVRS-Tactical starlight night vision scope is a professional-quality device designed to provide high quality viewing in nearly total darkness. 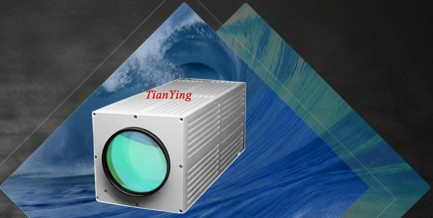 Many active night vision devices require an artificial infrared light source. The NVRS-Tactical is a passive starlight device: it does NOT require any artificial light source. The NVRS-Tactical does include a powerful infrared illuminator that is useful when the subject to be viewed is in shadows or total darkness. 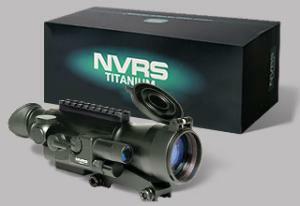 The NVRS-Tactical consists of a sophisticated electro-optical assembly contained in an extremely durable titanium housing. 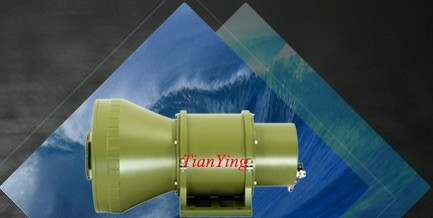 The entire unit is ruggedized for extreme field conditions. 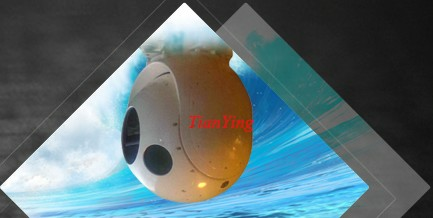 It is entirely self-contained and can operate for up to 50 hours at temperatures ranging from -22F to +104F ( -30C ~ +40C ). · Do not point the NVRS-Tactical towards any light source greater than 1 lux (such as car headlights) if the unit has been activated or if the eyepiece shows a green glow. Turn the unit off and wait until the green glow dissipates before removing the lens cap. · Do not open the case of the NVRS-Tactical or otherwise attempt to service this device. · Clean optical parts (lenses) with professional lens-cleaning supplies designed for use with multicoated optics. Failure to observe these warnings may void the warranty! To install the two AA batteries, unscrew the battery compartment cover. Slide in the batteries according to +/- polarity indicated on the cover. Tighten the battery compartment cover (1) . Clean the lens with professional lens cleaning supplies intended for use with multicoated optics. Your NVRS-Tactical scope operates using two AA batteries. Make sure they have been installed according to instructions listed in the Battery Installation section. · Move into a dark area before powering on the device. You can also try your scope in daylight with the lens cover on. · Remove the lens cap (2) only when the scope is in the dark. · Activate the device by turning the power switch (3) down to the first click (ON position). · When additional illumination is needed, activate the IR illuminator by turning the power switch (3) until second click (IR position). · To illuminate the reticle, turn the switch (4) clockwise and adjust the reticle brightness by rotating the switch clockwise or counterclockwise. · To focus the scope, select an object approximately 100 yds. away. · Set the lever of the objective lens focusing ring (5) opposite the mark “100 m”. · Direct your riflescope at the subject to be viewed and rotate the eyepiece focusing ring (6) until the image quality is optimal. · The green LED indicates that the scope is on. · After these adjustments irrespective of distance and other conditions, do not rotate the eyepiece ring (6), - adjust the image quality by rotating the lever of the objective lens focusing ring (5). 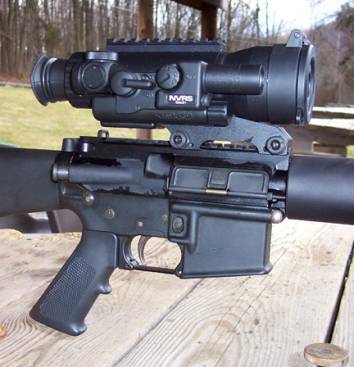 · The night vision riflescope NVRS-Tactical can be attached on any rifle equipped with a bar for side or top mounting by use of a Weaver mount (7). · After mounting the riflescope, it will be necessary to zero the scope by firing at a target and making the necessary adjustments using the reticle-adjusting knobs (8). · You may power up the scope and the IR illuminator via the remote control accessory by inserting the connector of the remote into the jack (9). ATTENTION! Your NVRS-Tactical can be used in extremely cold temperatures. However, when the unit is brought back into a warm environment, you must wait approximately 5 HOURS before using the unit. This is due to condensation that may accumulate on the electronic circuitry. 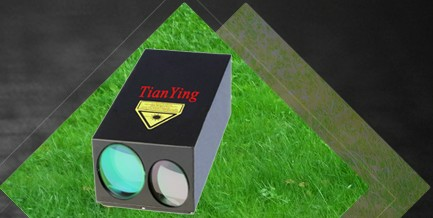 · check the accuracy of adjustment by shooting. Your riflescope is zeroed at a chosen distance. 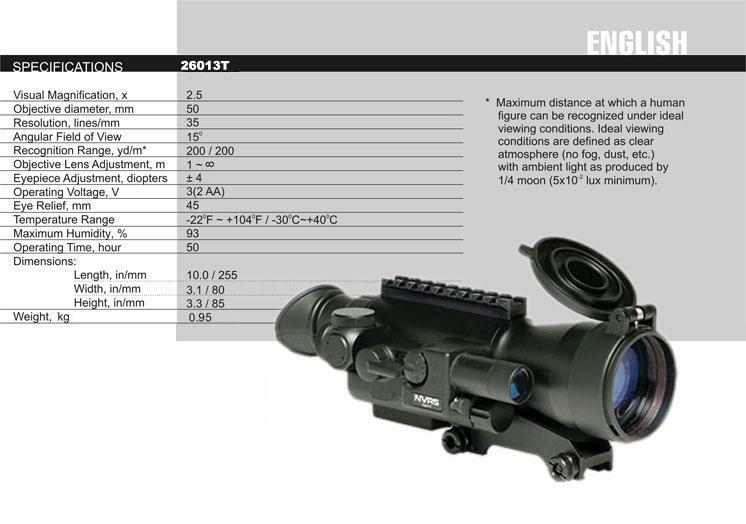 The recommended energy for Generation 1 Riflescopes NVRS-Tactical should not exceed 3700 Joules. The Gen. 1 riflescopes tolerate the overload shock corresponding to the caliber of no more than 7.62/.300. The guarantee is null and void if cartridges with calibers of more than 7.62/.300 or self-made cartridges have been used. To avoid failures during operation of your riflescope and to provide the detection and elimination of reasons causing the premature deterioration of assemblies and parts in time, it is necessary to carry out technical inspection and current technical maintenance of the riflescope. · if the riflescope is on. Pay particular attention to ensure that batteries have been installed. · clean the optics of the scope using a light coating of lens cleaning solution on a soft cotton cloth. ATTENTION! DISMANTLEMENT OF THE RIFLESCOPE IS PROHIBITED! You can take night pictures with the help of the riflescope using digital cameras. For these purposes you require a night vision photo adapter for digital cameras. Install the reducer into a riflescope’s mount. Setup the digital camera is done according to the photo adapter operating manual. Always store the NVRS- Tactical in its case in a dry, well-ventilated area away from heating/air conditioning vents, or heating devices. Temperature should not go below +50F. Humidity should not exceed 70%. Remove the batteries if the device is to be stored for longer than 2 months. Check that the battery is installed properly. Install the battery according to the (+) and (-) polarity, ensuring that the markings on the battery and battery compartment correspond with one another. Check the battery contact to ensure it is clean and free of corrosion; if necessary, clean the contact. Make sure that the external contact lug is not broken. If necessary, replace the battery as it may be depleted. Also, be sure that the power is in the “ON” position when trying to turn on the scope. The dots are minor cosmetic blemishes resulting from tube production processes and do not interfere with the reliability or performance of the riflescope. The scope may flicker or flash when used in a bright environment; to correct this, place the cap over the objective lens and enter a dark environment. The scope will restore itself to a natural functioning state in several minutes or hours, depending on how long the scope had been exposed to the light. The scope may flicker for the first several seconds of use, even when in a dark environment, before the scope corrects itself and functions properly. The scope may “snow” for several minutes after being exposed to a bright light source (daylight, a car's headlights, fire, etc.) even if being operated in complete darkness. The diopter adjustment range of the eyepiece is not powerful enough for your eye; if you use glasses stronger than +/- 5 diopters, use your glasses while looking through the eyepiece. Make sure the lenses are not foggy or dusty; if so, carefully clean the external surfaces of lenses with a soft cotton fabric. Replace the battery if the total battery charge is less than 2.2 V. When the unit is brought into a warm environment from a cold one, condensation may appear on the internal lenses; you must wait two hours before using the unit. If the scope was activated by remote control, then turn the scope and IR off by again using the remote control. Make sure that the scope is firmly attached to the mount and be sure that the same caliber and type of bullets are being used as when the scope was initially sighted in. 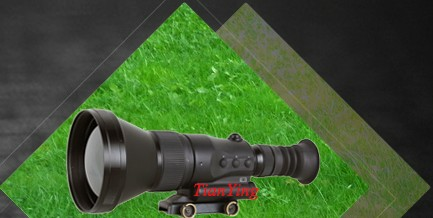 If the scope was sighted in during the summer, and is now being used in the winter, or vice versa, a small displacement of the aiming point is possible. Bright light sources, such as headlights, may cause visibility to decrease or disappear and the image to flicker. Turn the power off and turn the riflescope away from the light source; visibility will restore itself in several minutes.